The D-Link DXS-3350SR 48-Port Managed Stackable Multilayer Switch is part of the xStack series. D-Link’s xStack Switches are a series of “Next Generation” high performance stackable switches that deliver high scalability, wire-speed Gigabit performance, high availability, integrated 10-Gigabit stacking, redundant power options, and the option to stack in a “ring” or “star” topology. The xStack DXS-3350SR stacks up to 8 units* in a stack, providing up to 384 Gigabit ports, and up to 40Gbps of stacking bandwidth. 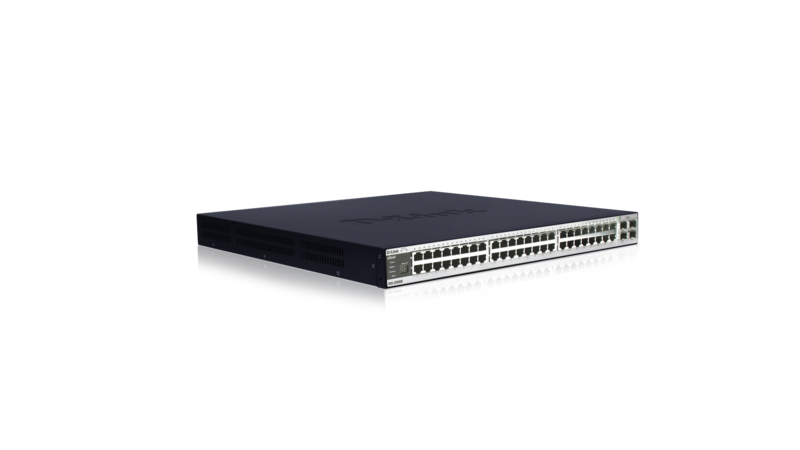 It can stack with the other xStack switches like the DGS-3324SR, DGS-3324SRi, and DXS-3326GSR, providing unprecedented flexibility. It provides 48 built-in copper Gigabit ports, including (4) Combo SFP ports supporting either copper links or SFP transceivers for easy, flexible connection to fiber-based Gigabit media and a switching capacity of up to 176Gbps per switch. In addition, the DXS-3350SR supports an optional module to provide an additional 2 ports of either 10 Gigabit fiber XFP ports (DEM-420X) or 10 Gigabit copper CX-4 (DEM-420CX) for uplinking to servers, storage, or backbone switches. In a ring stacking topology, the DXS-3350SR supports “Shortest-Path” switching which improves resiliency, uptime and network efficiency. It also supports an optional Redundant Power Supply (DPS-500). It includes support for 802.3ad Link Aggregation, 802.1d Spanning Tree, and 802.1w Rapid Spanning Tree for increased network reliability and availability. The DXS-3350SR features a variety of network management options: console CLI, telnet, web, SNMPv1/v2/v3, RMON, TFTP, Port Mirroring, BootP, and DHCP. It also supports a variety of advanced traffic management options including: Bandwidth Control, Broadcast Storm Control, and support for IGMP Snooping v1/v2/v3. D-link exclusive SIM technology is also supported. This feature allows up to 32 units of D-link switches to be managed under a single IP, regardless of physical environment. The DXS-3350SR provides a robust and consistent set of QoS/CoS, VLAN, and Security features. It supports 8 priority queues for 802.1p/ToS/DiffServ, with classification and marking based on MAC SA/DA, IP SA/DA, TCP/UDP, and IPv6 address and traffic class. Layer 3 dynamic routing protocols include: RIPv1/v2, OSPFv2, PIM-DM, and DVMRP. Security features include: 802.1x (Port/ MAC-based Authentication), port security, and Access Control Lists (ACL) based on MAC address, IP address, and/or TCP/UDP port numbers. It also provides extensive support for GARP/GVRP, 802.1q, and port-based VLANs for up to 4000 groups per device. The DXS-3350SR is the latest example of D-Link’s continued commitment to our channel partners and customers to be the industry leader in cost-effective, reliable, high performance, feature-rich switches. * Stack up to 8 DXS-3350SR. Up to 12 units in a mixed stack with other xStack 3300 series switches.